You are here: Home / One Verse / [#54] Genesis 4:4-5 – Why Did God Reject Cain’s Offering? I think personally that translations,and mis-translations of the original text. One could interpret the story in non-literal terms, as Freud or Jung might have, and simply describe it as a teaching story on how parental favoritism can lead to sibling rivalry. Or, one could take a more Gnostic approach and turn the whole story round on Yahweh, indicting him, as did early Christian ministers like Valentinus. The problem, is not Cain, but Yahweh. Yahweh is simply not the true God. Rather, he is the “god who created the world”, imperfect, making mistakes, changing his mind. He is a created being, created by the “true” God to preside over the affairs of men, so to speak. (He is alternately called Demiurge, Samael, and Ialdabaoth, depending on which gnostic teacher you read). So, one Gnostic interpretation of the Cain and Abel story might be that it isn’t really about Cain’s wickedness at all. Rather, it is about what happens when someone who is not God gets a God-complex of sorts (e.g., like an authoritarian father who can never be wrong) and how that can wreak havoc in a family. 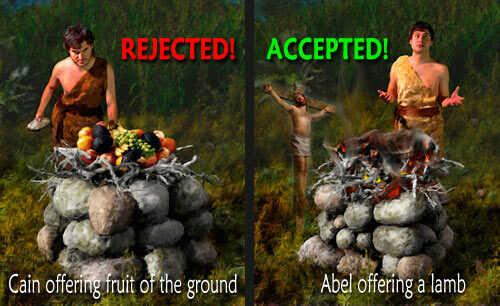 “By faith Abel offered unto God a more excellent sacrifice than Cain, by which he obtained witness that he was righteous, God testifying of his gifts: and by it he being dead yet speaketh.” Notice first that Abel offered a more excellent sacrifice, so the kind of sacrifice he offered was better than that of Cain. The offering of the herd was a picture of the coming sacrifice of Christ. 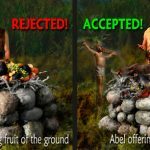 The offering of the fruit of the ground was a picture of the works of man. Notice that it came from the ground that God had just cursed (Genesis 3:17). But all in all,I truly suggest the original language.. Please help me Jeremy , please I want to go to heaven I want to still have a chance. I want to celebrate the wonderful holiday of Christmas! If you have believed in Jesus for eternal life, then you have it! Celebrate Christmas in the knowledge that you are part of the family of God. These are good gospel truths, and will help a person believe in Jesus for eternal life. But it is believing in Jesus for eternal life (not these other truths) that allows them to receive it. Remember, prior to the death of Jesus, none of the apostles believes any of those things you mentioned, but they all had eternal life. Audio deals exactly with this topic. 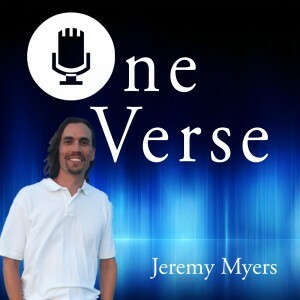 Jeremy Myers- I listened to your audio. You make a very astute point that God never changed His view about man. I would however ask you to reconsider your point about the sacrifice though. There are many within the grace circles that have correctly understood that God is full of forgiveness, this never needed to punish His own son in order to forgive us, but what’s not do clear is that man needs to see blood in order to perceive our own forgiveness. The blood sacrifice has always been about God doing what He needed to do so that we could perceive forgiveness. He has to take every evil blow from mankind without fighting back before we were convinced that He loves without condition. The Father had to die on the cross and Jesus simply showed us the same. Genesis 3 is about God convincing Adam that everything was ok. It was Adam that ran from God out of fear. Fig leaves were insufficient to bring him out of hiding, but the blood did the trick. Bible says Love covers a multitude of sins. The lamb slain at the cross is the John 3:16 symbol of just how much God loves the whole world. What God is looking for is repentence and a turning to him rather than a turning away from him.God instituted the animal sacrifices to show just how bad sin was so we would be sorry that we greived him.For us to be made right there has to be a choice to turn from sin and follow him and out of that decision there should be a desire to walk in his ways.Under the old law part of that obedience was to make offerings however it was by faith in God that made the person righteous and not the blood of animals. Imagine I committed a crime and was sent to prison to pay for it. On the day I was released, could the judge who sentenced me to prison show up as I walked out the prison door and say, “I now forgive you for the crime. You are a free man!”? No. The penalty was paid. Once the penalty is paid, forgiveness cannot be offered. And vice versa. If forgiveness is offered, the penalty does not need to be paid. The two are mutually exclusive. So also with God’s forgiveness. He does not need to be paid in blood in order to extend forgiveness. In fact, IF He is paid for sin through sacrifice, then He cannot extend forgiveness, because the penalty has been paid. Payment for sin through sacrifice and the forgiveness of sin through grace are mutually exclusive. The sacrifice is not about a payment. Not at all. When you wake up in the middle of the night to feed your crying baby, you are sacrificing your sleep out of love. Nobody is getting paid, but your child is experiencing the love needed to give them life. Jesus sacrificed his life that we might feel loved. That’s it. One more point… Nobody said a crime was committed. I understand the false doctrine you are trying to refute, but there is an entirely different logic (reverse logic) associated with the sacrifice that must be considered. It’s not God that needs to change His views, but man does. Everything that God ordained was about convincing us of the truth that sets us free. But since it seems you like questions, let me ask you one… When the secret service agent takes a bullet and dies for the POTUS, did he sacrifice his life? Who got paid? Love is the motive for sacrifice. Every parent has made many sacrifices for their kids. God is the best Father. God is love. The Levitical law’s sacrificial system didn’t pertain to atonement and forgiveness though, it was a means of maintaining ritual purity within sacred space. The Day of Atonement itself had 2 goats, one as a sin offering (better translated decontamination / purification offering) and the other, a live goat, which had the ‘sins’ of the people placed upon its head and sent off into the wilderness ‘to Azazel’. As far as Jesus sacrifice goes, I think N.T. Wright hits it on the head in ‘The Day the Revolution Began’ in that in bringing about the ‘Law’, Sin was brought out into the open, and Jesus drew that sin upon himself in order to put it to death in his flesh, and deal with it once and for all. It wasn’t a case of ‘God so HATED the world that he KILLED his only son’, but very much as the verse states in John 3, ‘God so LOVED the world that he GAVE his only son’. Nathan Patterson – the sacrificial system was both for atonement and forgiveness, but you must see the same reverse logic (spiritual lense) that I am speaking of. God is sacrificing Himself to help us believe that we have been forgiven (not so He can forgive). Atonement indicates a means for forgiveness has been put in play. The “means” is a powerful demonstration of love. The life within the blood is what has to be spilled to prove unconditional commitment. When humans (kids) do everything bad under the sun, but God (Father) elects to love them thru it all, they will ultimately realize they are loved. God is our Father. He has to allow humanity to kill Him (without fighting back) as this is the only way we’ll be convinced that He loves without condition. This is the atonement sacrifice, which was designed to convince us of the truth. This is the sole reason Jesus was born and came to earth. Bear witness to the Truth! I apologize. Sorry. Yes, those are legitimate and good ways of sacrifice. In this way, Jesus also sacrificed Himself. Thanks for helping me see your point. Nathan Patterson- I’m well versed myself in the book of Leviticus. I’m a student of the old testament, particularly the Torah. Be happy to listen to the broadcast, but have already provided a lot of information about atonement, that if you can’t explain, would suggest your understanding may not be what you think it is. Conversely, I’m open to address any scripture that you think undermines the atonement theology. Karl, I love your underhanded comments towards other believers because they don’t agree with your understanding of scripture. What is the law anyway? Some merit based system that if help, will get you your ‘get into heaven free’ pass? Or is the law something that was given to the people of Israel as a means of maintaining the covenant with YHWH whom elected them as a people to be the light of the world, and bring about Messiah, whom would deal with sin? I believe it’s the latter, and individuals such as E.P Sanders, James Dunn, and N.T. 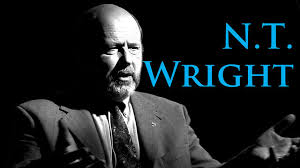 Wright have provided solid arguments for that by going back to the 2nd temple Jewish texts to mine their riches and help us better understand today what it was all about. Nathan Patterson – first I want to apologize for any underhanded comments that you think I’m making. I really don’t want to offend anybody, but you are not the first person to tell me this. Can you be more precise about what is aggravating with my speech? I really want to improve my communication skills. Thanks for being candid and polite. Nathan Patterson – The law represents what the messiah would accomplish as the means to save humanity. It is a picture of what love looks like when perfectly expressed by a human being (Jesus). God gave the law as a witness or testament to the truth. Christ fulfilled the prophecy of the law, which is the evidence that God loves the whole world. The Jews however thought God gave the law for them to fulfill, thus they tried their best to fulfill it. Nobody can keep the law except Jesus Christ, because the law reflects the very nature of God Himself. All other human beings are flawed by sin, which is what it means to transgress the law. God removed the curse off the ground thru the revelation that Noah introduced. God demonstrated His Way to forgiveness, immediately after Adam and Eve sinned in the Garden of Eden by shedding the blood of an innocent animal and then fashioned clothes for them from the innocent animal’s skin. Adam surely passed God’s Way of Forgiveness on to his children. Therefore, Cain knew God’s Way, buy with pride in the work of his hands, thought to change God’s chosen Way for his own prideful way, which BTW, shed NO blood, so there was no substitutionary death. Cain knew how to please God by using God’s approved Way and in rebellion, chose to do it his own way which seemed right to him in his own eyes. Also God had cursed the land because of sin. This incident teaches us many lessons. 6) That pride and rebellion are sins as these are the very sins of Satan. There are probably many more lessons that we can learn from this one incident, but I will stop for now. May God continue to richly bless you and your loving family. HI Amy, in a previous episode, I show that there was no shedding of blood in Genesis 3 either. This forms the basis for what I taught in this episode on Genesis 4:1-3. Jeremy i agree there was no need for animal blood to be shed for the forgiveness of sins when faith was all that was needed.Abraham was credited by God as righteous because he believed God.That is all that God requires of us.That must come first before offerings it is the same for works they can be works of faith or works of the flesh it all depends on if our heart is right before God. The sacrifices were required because people still sinned. Abraham was justified by faith, but he wasn’t born again, baptized into the body of Christ or sealed by the Holy Spirit unto the day of redemption. Until Jesus died on the across and provided the perfect once and for all sacrifice the animal sacrifices were required to cover the sins even though they couldn’t take away the sins. When I read David’s fervent prayers of repentance and forgiveness and Isaiah’s wonderful poetry of reconciliation and deliverance I find it hard to fit God’s message of grace and loving mercy into a neat legalistic formula. Thank you. So am I on the right track according to your analysis of the incident? The blood sacrifice was all about God teaching man the truth, so we could see and believe. God sacrificed Himself, so man would know just how much we’re loved by the Father. Mankind couldn’t see this John 3:16 truth, so Jesus was sent to reveal it. The greatest love that can be demonstrated for another requires that the agent of love die a sacrificial death. This is why Jesus had to drink from the cup of the blood sacrifice. 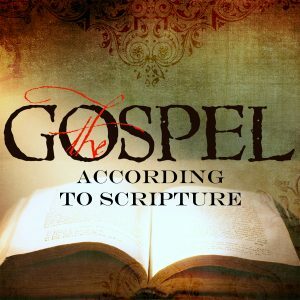 The audio links above (God’s covenant of grace) deals precisely with the scriptures in question, followed by “Noah’s flood” which goes a bit deeper to reveal the spiritual truth within the Genesis text. 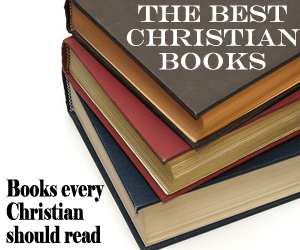 These stories are not about Adam and Eve, but God is teaching us about Christ! The entire old testament is about Christ, thus until one sees Christ, we cannot know what God is spiritually saying. Because Genesis is about the “creation”/birth of Israel… therefore God favors the sacrifice offered by Israel. Not the blood of animals only the blood of Jesus. God is not a blood thirsty tyrant in need of a sacrifice. Sacrifices are man made, not God ordained. Absolutely correct. That is precisely what I argue. Bj did you pick it up from the verse that it was nt the lamb or the offerings that Cain bought that was acceptable to God it was tht ables heart was right before God.Cains offering wasnt accepted because his heart wasnt right towards God he was not walking by faith but by the flesh that speaks of self effort and pride that was why his offering wasnt accepted.Without faith it is impossible to please God. Scott how could you say that have you not read genesis it means the beginning the beginning of the human race the reason why we were created why had to God sent his son we all trace our ancestry back to Adam and Eve.This is relevant to all of us as through Jesus Christ everyone of us has been redeemed and yes the jews are important because salvation came through them Jesus was a Jew or Israelite. Why does he look upset in the image and Jeremy, I have said God was a demon kind of normally and a few times accidentally. Jeremy , so much has happened so much has been said, so much very much. With all that has been said I can see and understand the possibility of me committing the unforgivable sin. Mitchell, you are completely loved and forgiven. God has not abandoned or rejected you. Look to Jesus and see how much you are loved by God! Jesus’ death and resurrection had no impact on the OT saints until He actually accomplished the once and for all sacrifice for sins. The OT sacrifices were like writing checks. The check is no good unless there is money in the bank account to cover it. God allowed the OT saints to “write checks” through the animal sacrificial system, but it was Jesus’ death and resurrection that put the money into the account and actually took away their sins. The animal sacrifices “covered” their sins. Jesus’ sacrifice took away their (and our) sins. They did not experience salvation like we do. They were not born again, baptized into the body of Christ, and permanently indwelt and sealed by the Holy Spirit unto the day of redemption. Faith is required throughout the Bible, but in the OT their faith was in God and His commandments whereas our faith is in the finished work of the cross. Craig i appreciate what you are saying but God is not limited by time or space as we are and was able to make transactions looking back from the cross to him time happens all at the same time provision was made on the basis of faith and by the grace of God to all sinners past present and future. You’re correct in acknowledging God’s infiniteness and power, yet at the same time you’re ignoring God by ignoring His word. Read Leviticus. Note what it says about sin offerings. The offering is made because someone sinned. All people are ultimately saved by Jesus and His work on the cross, but during the time of the OT they were not saved by Jesus’ work on the cross because it had not yet occurred and because to be saved by Jesus’ work on the cross you have to believe in Jesus and His death and resurrection on your behalf which those in the OT were not aware of. Yes there are passages that point out what Jesus would do but the OT folks did not fully understand the implications. Enoch is an exception. If you’re going to hang your doctrinal hat on Enoch’s experience alone, ignoring everything else in scripture you’re going to wind up in error. Everyone has to have a point of faith. Not everyone in the OT had the same knowledge of God. Adam and Eve passed on their knowledge of God and that’s was the point of people’s faith. After the flood God Abraham and gave him further revelation and then to Moses and the nation of Israel God gave the Law and more revelation. During the time of the Law God raised up prophets and gave more revelation. My point is we are accountable to have faith in the truth revealed to us and they didn’t know about Jesus or understand about His coming death and resurrection so how could they be saved by Him during the OT? Craig i hear what you are saying but we are accepted by God by faith just like Abraham.Its scriptural because abraham believed God it was credited to him as righteousness.So abraham was saved its not the offering that saved him. It is having a right heart before God the same reason that ables sacrifice was accepted not the other way around otherwise we can buy our way to heaven That is why Cains offering wasnt accepted his heart wasnt right..Ultimately our faith needs to be in Jesus Christ he is the perfect saviour the animal sacrifice clearly shows the cost of sin it requires a death to give life to another.That was Gods promise sadly the Jews thought more of the offering and the laws therefore nullifying the grace of God over them.In effect they chose to go the same path as Cain and instead of killing his brother they crucified Christ. God was the one who instituted the sacrificial system under the Law. It was temporary (until Jesus’ perfect once and for all sacrifice) and could only cover sins, not take them away. God’s problem wasn’t with the Jews’ sacrifices but they had turned it into a dry legalistic religious function. God’s intention was it was to be a constant reminder of that sins had to be accounted for. So when Jesus told the paralyzed man that his sins were forgiven ( Luke 5 ), are we to understand that Jesus words were without any force because there was no sacrifice to cover and no crucifixion yet to take them away. I find it difficult to state what God’s intentions and enterprises are , beyond what God has stated them to be. Jesus is God and has the power to do what He wants, but one thing He won’t do is contradict His word which He gave us. The fact that Jesus is the same yesterday, today and forever and has the power to do what He wants does not negate what He has provided in His perfect, infallible word. Jesus became man (God manifest in the flesh) at a point in time and His death on the cross and His resurrection occurred at a point in time. Once His sacrificial death and resurrection occurred those in the OT who had faith in God had their sins taken away, but not before then. Their sins were covered by the OT animal sacrifices, but not taken away until Jesus’ work on the cross. When people in the Old Testament were saved nothing happened IN them spiritually. 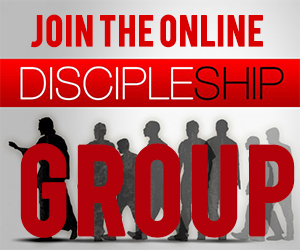 Of course, God imputed righteousness to their account when they obeyed him, but they were not regenerated, a son of God, indwelt and sealed by the Holy Spirit, part of the body of Christ, and the rest of the salvation doctrines unique to this age. Craig thanks for commenting the issue i have is that we are saved by faith and by the grace of God both in the old and the new.Not by the blood sacrifices of animals i am not saying they are not important as they served an important role in the old testament.But even if cain had offered a lamb his sacrifice would still not have been accepted because it wasnt given in faith but by works his heart wasnt right so his offering wasnt accepted. romans 4: 3For what does the Scripture say? “- Abraham believed God, and it was credited to him as righteousness. Craig says ;When people in the Old Testament were saved nothing happened IN them spiritually. I don’t know how David could have written Psalm 51 if nothing spiritual happened in him. In fact this psalm discounts sacrificial burnt offerings in favour of spiritual renewal. Which gets back to Cain and Abel. A story about spiritual substance not correct liturgy. The Holy Spirit came upon certain individuals, but it wasn’t a permanent indwelling like we experience. Look at Saul. The Spirit came on him and later departed from him. David prayed that God wouldn’t take the Spirit away from him. I’m not sure how the subject of liturgy entered, but all one has to do is read Leviticus to see the importance of the animal sacrifices. Liturgy refers to formal set procedures in worship. A formulaic approach if you like. Every time people try to ” explain” God’s ways according to some sort of dogmatic certainty the bible throws a spanner into the works. The Israelis thought they had it mapped out with the “required” levitical sacrifices and along comes Hosea and tells them that God says ” For what I desire is mercy not sacrifices, knowledge of God more than burnt offerings “. Jesus quoted that passage from Hosea. And in the light of Jesus we maybe understand Cain and Abel. 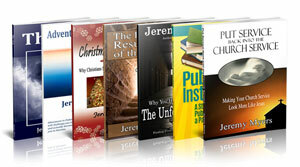 And it was Jesus above all who throws into disarray all the neat ideas about what God supposedly requires. Jesus forgave people who didn’t even repent or ask for it. Sorry if my writing is a bit disjointed. The subject is so large for my rather small grasp of God’s infinite and surprising ways. Old Testament salvation is a difficult subject to tackle. For instance you have the period in the garden of Eden before the fall, the time period after Adam and Eve are made to leave the garden Eden, the call of Abraham and then the establishment of the nation of Israel and God giving them the Law. They couldn’t have the same salvation experience that we in the church age have because during the OT Jesus had not yet died and you have to believe on His death and resurrection to be saved as we are. brentnz says – Craig i hear what you are saying but we are accepted by God by faith just like Abraham.Its scriptural because abraham believed God it was credited to him as righteousness.So abraham was saved its not the offering that saved him. It is having a right heart before God the same reason that ables sacrifice was accepted not the other way around otherwise we can buy our way to heaven That is why Cains offering wasnt accepted his heart wasnt right..Ultimately our faith needs to be in Jesus Christ he is the perfect saviour the animal sacrifice clearly shows the cost of sin it requires a death to give life to another.That was Gods promise sadly the Jews thought more of the offering and the laws therefore nullifying the grace of God over them.In effect they chose to go the same path as Cain and instead of killing his brother they crucified Christ. Craig says – Faith is required throughout the Bible, but faith has to have an object. God made promises to Abraham and Abraham believed God would make good on those promises and was justified. He didn’t believe on Jesus. He didn’t believe in Jesus’ death and resurrection for his salvation. He wasn’t baptized into the body of Christ and indwelt and sealed by the Holy Spirit unto the day of redemption. He wasn’t part of the church which is the body of Christ. No one in the OT was. The taking away of the sins of OT saints didn’t occur until the cross. We live in a unique age in history (church age) in that by believing the gospel (Jesus’ death on the cross and resurrection) we experience all of the above I mentioned (and more) that the OT saints didn’t. This scripture jumped out at me when i came across it particularly about the priest.This is about the offering for both sin and guilt in the old testament in Leviticus 5:1-13. “‘He shall also bring his guilt offering to the LORD for his sin which he has committed, a female from the flock, a lamb or a goat as a sin offering. So the priest shall make atonement on his behalf for his sin’”(Lev. 5:6).